Are you ready for another day of My Creative Time sneak peeks? Today we have another fun new set to share with you called Gobble Gobble! This set has the most adorable images with coordinating dies, as well as lots of fun sentiments! I just adore the pumpkin spice sentiment from this new set, and I thought it would be perfect to use on a card that would hold a Starbucks card. For my card base I used the Surprise Pop-Out Card Die. One of the MORE Stitched Rectangular Dies fits in the little pop out section really nicely, so I used it to cut some woodgrain paper, and it was there where I stamped the sentiment and also added an adorable little coffee cup made with stamps and dies from We're Better Together. 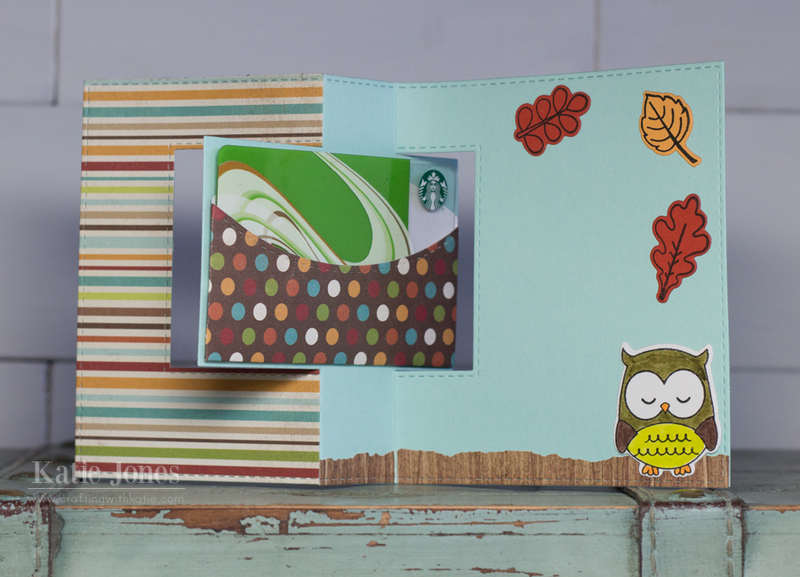 On the other side of the pop-out piece, I adhered a gift card pocket made with the Stitched Gift Card Pocket Die. I then used more stamps and dies from Gobble Gobble to make the pretty leaves and the sweet little owl, which I colored with my Zig Clean Color Real Brush Pens. I decided the owl needed something under him to help ground him, so I cut some more woodgrain paper, trimming it with one of the More Stitched Edges Dies. I've only scratched the surface using this Gobble Gobble set. There are so many more fun sentiments and images that will be very fun for fall and Thanksgiving projects! Very cute card style! 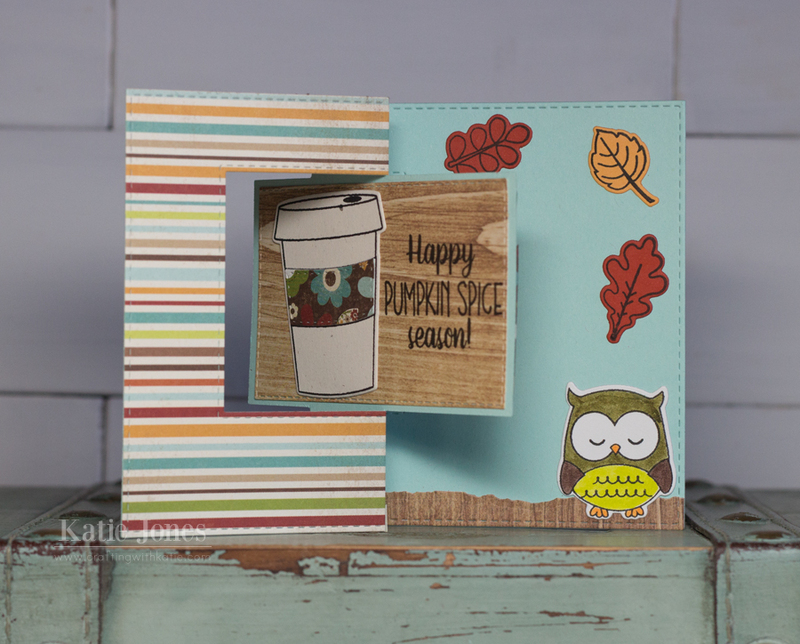 I love the cute little owl and that sentiment is perfect for the fall time! Great colors! Thanks for sharing! OMG Miss Katie What An Amazing and Gorgeous Card!! Love your Kuppa Kuppa Idea..hmmmm wonder why!! LOL You sure came up with lots of Spectacular ideas using Miss Emma's Goodies. Love the colors and your owl is so precious!! Definitely a Super Outstanding Creative job!! Super fun card. I always want to use the card die. Thanks for the inspiration. What an amazing card idea! I love this. The owl is so cute! Love your card/gift card holder! You decorated it so cute! I'm a leaf person, so I love the leaves on the card, too! What an awesome job!! It looks wonderful!! I love the gift card idea on this swing card! This is just fabulous! Wow I loVe your cute flip card. Thanks for sharing. Lovely!!! i love your card, the colors are so pretty. What a wonderful fall card. This will be a fun set this time of year. Fun coffee card - Great for a gift card! O.k., I'm totally stealing your idea because it is awesome!!! What a fantastic card and adding the gift card is just perfect. Thanks for sharing your creativity with us. What a fun card! Love the hidden gift card on it too! Fabulous! Adorable--I like the fold and your choice of papers. Love the shape of the card. Get tired of the same old square card. Clever idea to use for a gift card. Cute way to hold a gift card! Isn't the owl adorable? Great job on your card! Such a great idea for a gift card. The card is just amazing. Great job! Wow! I LOVE this gift card holder! It looks AWESOME! Super fab gift card holder, Katie!!! What a totally great idea!! I'm so inspired!!! Love this new set and delightful sentiment!!! Super cute card and card design! Another fun release and wonderful inspiration!